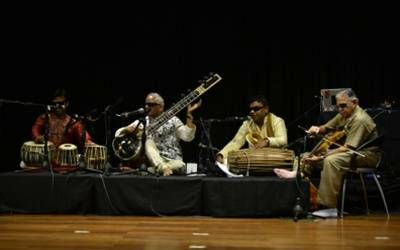 New Delhi, Sep 16 (IANS) Music is not just for the sighted, as it stems from the body’s rhythm, visually-impaired multi-instrumentalist Baluji Shrivastav said at his performance "Antardrishti: Inner Vision" at the British Council here. The Indo-British musician was appointed the Officer of the Order of the British Empire (OBE) — a Queen’s honour — for his services to music in 2016. "I could feel my heart is thumping, and so is everybody else’s, and that was the metre of music for me," he told IANS on the sidelines of his performance, elaborating on the inner vision he developed. "You’re speaking, I’m speaking. That’s also music." "I was excited to choose Mahabharata because of Dhritarashtra, who himself was blind. The eleventh chapter of Gita because it’s here when Lord Krishna shows his ‘Vishwaroopam’ (grand avatar) to Arjuna, and makes him look beyond the obvious" the master sitarist explained. As his Orchestra played striking music at the British Council here, it was accompanied by the graceful gestures and body movements by an Indian classical dance group headed by Arunima Kumar — all feeding into a beautiful recital of Gita’s 11th chapter "Vishwaroopam Darshana". As British Council’s North India Director Tom Birtwistle put it, the performance celebrates the "equal contribution made by differently-abled people to communities".